Rumor has it the Marlins caused a stir at the Ronald Reagan Washington National Airport. Something about several players being literally carried into the plane due to their unwillingness to leave because of their recent hitting streaks. Joking aside, the team must have wanted more games against the Nationals after their latest showdown. Miami rolled into Nationals Park hoping to steal some wins, they stole the series. The Nats came out swinging in the opener as Bryce Harper went 3-for-4 with a double, aiding Max Scherzer in dominating the fish, 8-2. While Miami produced nine hits, they went 1-for-5 with RISP. Both Dan Straily and Scherzer lasted six frames, with the former giving up five runs on nine hits, including two homers. Now it’s the Marlins’ turn. In Game two they jumped to an early lead in the second after Derek Dietrich hit a solo shot to center. Washington responded with two in the third before Miami tied it up in the fifth with an RBI double from JT Riddle, scoring Austin Dean. Riddle wasn’t done yet, weaving another run the following inning, this time an RBI single. And he still wasn’t finished. Riddle blasted the go-ahead dinger in the ninth, his sixth of the year, to put the team up 5-4. Tayron Guerrero blew the save sending the game into extras but that’s ok. Why? Because Isaac Galloway got to play hero, that’s why. Yep, Galloway worked some extra inning magic with a two-run single to give the club the lead and the win. 7-5 Marlins in 10. Sunday would be a long day for the Nationals as Jose Ureña took the hill, appealing a six-game suspension (He’d later drop the appeal). The Fish absolutely dominated their NL-East rivals both on the mound and at the plate. Ureña pitched a complete game surrendering one run on two hits. Two hits. So close, so close. Meanwhile, Miami put on a hit parade barraging the home team with 17 of em. The team launched three balls into outer space thanks to J.T. Realmuto, his twin Riddle and Galloway too. Starlin Castro had a terrific afternoon going 5-for-6 with two doubles and an RBI. Speaking of doubles, the Marlins slashed seven of them on the day. The team was also 8-for-16 with RISP. When the dust settled, it was no contest. 12-1 Fish. And so begins the homecoming. The Bronx Bombers came to South Florida for a two-game tilt, signaling Giancarlo Stanton’s return since the off-season trade to New York. With an overwhelmingly friendly crowd in favor of the Yanks, the fans were treated to a great baseball game. Pablo Lopez took to the mound, facing off against Masahiro Tanaka in what was ultimately a pitcher’s duel. Both hurlers kept the opposing team to just one run. Miami tied it in the fifth thanks to rookie Austin Dean’s solo shot to center. Dean had an awesome opportunity to do have his first career walk-off but struck out to a high fastball with one gone and the bases juiced. You could tell he REALLY wanted it, stay thirsty my friend. You’ll get it. Riddle also couldn’t clinch it, he grounded to second for the force out. New York broke through in the twelfth with a sac fly from Miguel Andujar, winning 2-1. The Marlins were a frustrating 0-for-10 with RISP, stranding 10. The home team vastly improved in game two, ultimately cranking out 14 hits and nine runs. Dean went 3-for-5 with an RBI while Miguel Rojas and a red-hot Riddle went yard, producing over half the runs. Riddle was pinch-hitting in the eighth when he unleashed a two-run blast to put the ballclub up 8-3. Rojas impressed his jubilant family who was in attendance Wednesday night, using his bat and his glove. In the sixth inning he homered to left for the go-ahead and in the ninth, he helped double up the speedy Brett Gardner. With runners at first and second, Gardner laced a grounder to first but Rojas scoped up the hard hit to orchestrate the 3-6-3 double play to end the game. Stanton was on deck. With the 9-3 win, the Fighting Fish split the home and season series. The two teams played a pair of home-and-home games with the Yankees always taking the opener… and the Marlins always countering. Emotions and nostalgia were likely the themes for Stanton, returning to a ballpark where he spent six of his eight seasons with the Marlins. You almost forget he once wore the old school Florida jersey. It’s the superior uniform, but I digress. Teal and black (And grey) aside, the four-time All-Star was contained to the field, going 3-for-9 with an RBI and striking out five times. It really was good to see him, although it’s still a bit weird seeing Stanton wearing the legendary pinstripes these days. In the end, as painful as it was initially the trade was for the best. The Marlins signed Giancarlo Stanton to the largest sports contract in history, to the tune of $325 million. It gets really heavy towards the end of this 13-year agreement. On his last season with the Fish, he was getting $14.5 million. Now? Its jumped to $25 million with it getting even higher at $29 million in 2021 and then $32 million from 2023-2025. That is some serious money. Mula the organization could not hope to pay given the state of affairs. With their deep pockets, the Yankees are really the only team that could write these sort of checks. Interestingly, Stanton can opt out after 2020. Life setting cash aside, the move of an incredible fan favorite and sports giant was a wise one. Unpopular but wiser as time goes on. I will always cheer him on and I hope he finally gets a ring for his efforts, he wasn’t getting one with us. For too many years he was on the losing side, now he’s on a team capable of giving him what he deserves. As of Thursday morning, he’s rocking a .285/.353/.895 slash line with 32 ding dongs and 80 RBIs. With 36 games left on the schedule, he will definitely hit 100 RBIs and probably 40-45 home runs, capping off another successful season. While you can’t help but admire the guy and his skill, Fish fans are left wondering what could’ve been. That’s been our theme for a long time now. Luckily, Derek Jeter intends to have the faithful look forward and not in the past. Give it time, DJ is a winner. He’s a former Yankee after all. Until next time, stay frosty. This one is for the former Marlin. Stanton’s first ever big league home run was a grand slam off Tampa Bay Rays pitcher Matt Garza back in 2010. 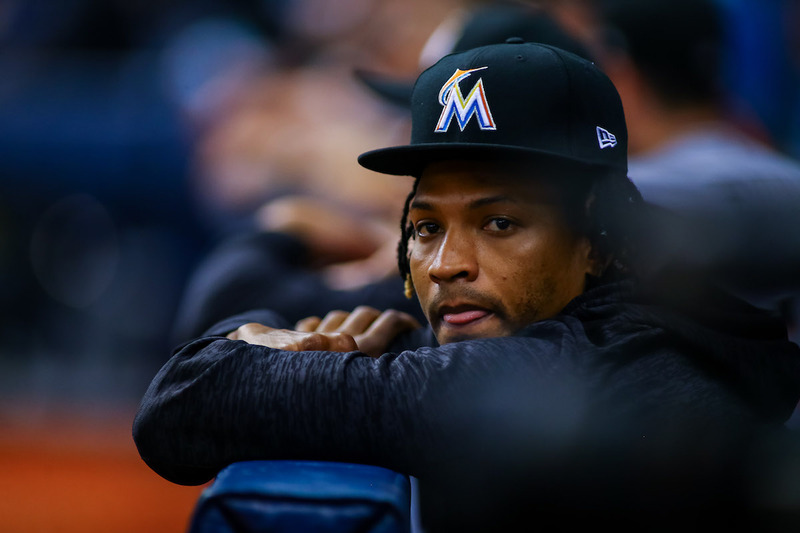 With it, he joined Mr. Marlins Jeff Conine, Chuck Carr, Quilvio Veras, Craig Counsell and Jeremy Hermida on the list of Marlins whose first homer came with the bases juiced.